Hopping into my hired Cinquecento I headed off under cloudless blue, late spring skies for the four hour drive across the island of Sicily from Trapani to the city of Syracuse on the south eastern shore. 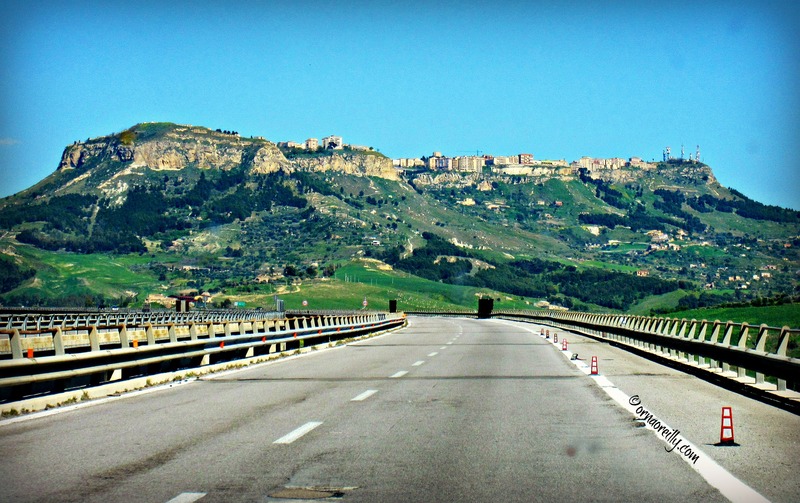 An interesting drive in itself, this autostrada is a feat of engineering as it curves through the mountains of central Sicily, passing evocative signposts such as Corleone and Prizzi. 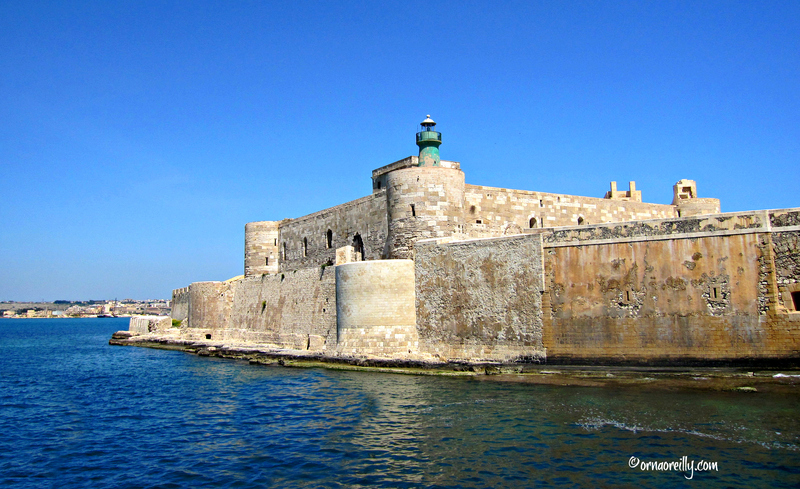 The little island of Ortigia is joined to Syracuse by three bridges over a narrow channel. It contains the historical centre of the city itself and is a warren of narrow streets and mellow baroque architecture. 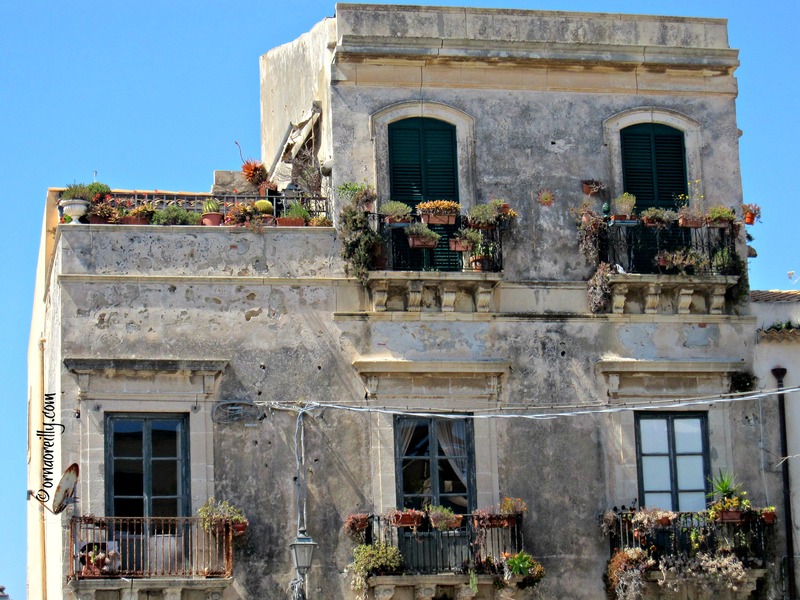 Arriving at my destination on the south side of the island, the Hotel Maniace, via the bustling narrow alleyways of Ortigia, I breathed a sigh of relief. The last part of the journey had been slightly confusing with Ms. Garmin, my Sat-Nav lady, insisting I “recalculate” at regular intervals, but I had survived and arrived in one piece. I couldn’t wait to explore. Ortigia, though tiny – approximately 1km by 500 metres – is packed with interesting things to see. It is a popular tourist destination, brim-full of a great variety of shops, bars and restaurants. Close to my hotel was the 13th century Castello Maniace jutting out into the sea overlooking the sheltered bay. Apparently, there has been some sort of defensive fort in this vital strategic position since Syracuse was first inhabited about 3000 years ago. Other interesting sights include the 7th century BC Temple of Apollo and busy Piazza Archimede with its extravagant fountain, named after Archimedes the famous mathematician who was born there in 287BC. Gorgeous Piazza Duomo reminded me of a huge outdoor sitting room with lots of bars and cafes, where you can sip on a limoncello or visit the striking Duomo and the church of Santa Lucia. Overall, Ortigia is the perfect place to stroll around, taking in the mellow architecture and visiting the most fantastic fish and vegetable market I have ever seen. Just listen to the fishmongers, as they sing out a litany of their produce for the entertainment of all! For details on how to get to Ortigia and full details click HERE. Wow, this place looks amazing! Your photos are outstanding, as always, and your post makes fascinating reading! Another one to add to my wish list!!! Orna, simply delightful commentary and as always spectacular photography. Beautiful, I want to visit now! I’ve never been to Sicily so I hope this year I’ll explore this amazing region! Fabulous photos! Orna, your photos are just beautiful. Do you use a camera or your iphone? Incredible photos – they really give the sense of being there. Loved Ortigia. Sicily is incredibly beautiful. Good luck with that Ishita! Stunning as always Orna..I find myself so in love with Sicily its beauty & charm..your photos just confirm my fascination.. Glorious traditions & history from the food to the architecture.